This is my entry for the CAS Winter Design Team challenge going on over at Splitcoast. Denise has asked us to make a card based on music from one of our favorite holiday movies. Who doesn’t love Rudoph the Red Nosed Reindeer…cartoon and song? I’ve taken artistic license and dropped the red nose but added a red bow instead! My card base is a standard A2 size in SU! Early Espresso. On top of that is a layer of ivory card stock that’s been dry embossed using a diffuser. It’s been stamped simply with the sentiment from Verve. The reindeer was made by glueing some Tim Holtz Tissue Wrap onto a piece of scrap card stock. One layer of Glue n’ Seal on the card stock, wrinkling the tissue wrap over top and then adding one more layer of the Glue n’ Seal over top. Once that was dry, I sponged some Distress Inks over top. 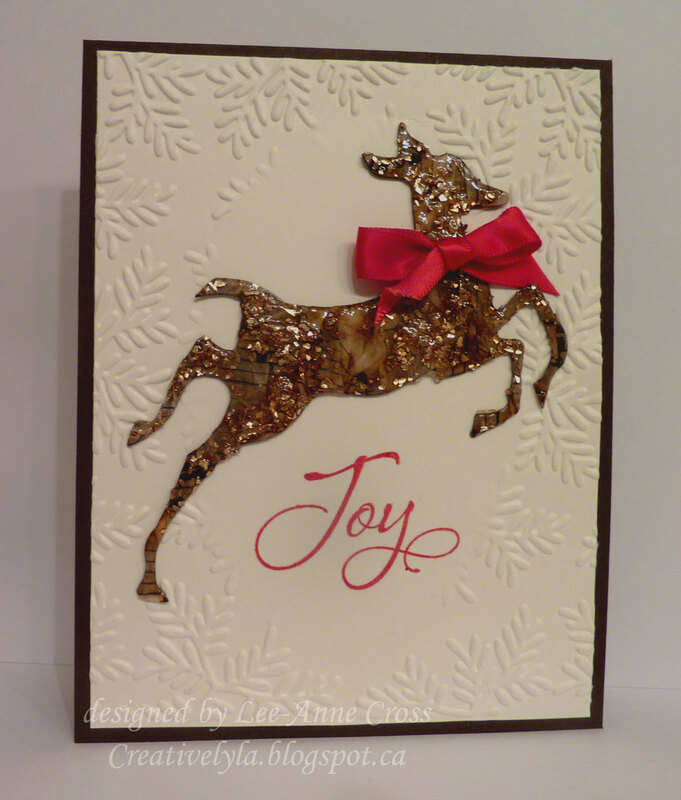 Next, it was cut with the Tim Holtz Reindeer Flight die. Then I added some bling by sprinkling some glass glitter randomly over the reindeer while allowing some of the musical print to show through. Next I added a moderate layer of Ranger Glossy Accents to seal in the glass glitter. My only embellishment…a simple red satin bow. Love the embossed pine boughs around the edges framing the reindeer. This is just gorgeous! what a wonderful Christmas card! So pretty! Love that bow, and the embossed white background frames your image so nicely. Well done!